Viet Nam Museum of Ethnology in Ha Noi held a series of cultural activities to welcome the Lunar New Year and spring festival of ethnic minority groups across the country on February 2. The museum invited Mong ethnic people from Sin Cheng Commune, Si Ma Cai District, Lao Cai Province to assemble a cay neu (New Year’s tree) on the grounds of the museum. 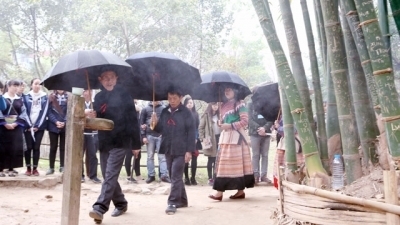 The ceremony is part of Gau Tao festival, a typical festival of the Mong people. Traditionally, on the 23rd day of the last lunar month, Vietnamese people usually hold a ceremony to set up a cay neu in front of their house. Cay neu is believed to help ward off evil spirits during the longest and most important annual festival in Viet Nam. On the seventh day of Lunar New Year, the tree is taken down. The tree is considered as a bridge for the gods and forefathers’ spirits to travel on between Heaven and Earth. Visitors to the festival also have a chance to enjoy many sport and cultural activities by other ethnic groups such as playing shuttlecock, pipe-blowing and crossbow-shooting by the Mong ethnic group; phao dat (soil-made firecrackers) and creating Dong Ho pictures by the Kinh ethnic group; along with folk games by the Si La and San Chay ethnic groups. 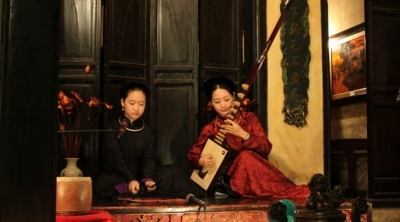 The event begins At Mui Spring festival programme, which will be officially held at the Viet Nam Museum of Ethnology on February 22-23.